The Kodachrome Basin State Park is dubbed to be one of the most picturesque parks for photographers and tourists. It features soaring chimneys. The Chimney Rock is the tallest one with about 67 pipes. This monolithic sedimentary rock is stunning and it is what makes the park look like it has natural skyscrapers. The pipes differ in size that may range from 2 meters to 52 meters. The height may range from 30 to ft tall. You can just imagine how high these pipes are. When it comes to the origin and as to how these chimneys were actually formed, geologies are still not so certain although they have established theories in mind. In these theories, it is believed that the pipes came from ancient springs or they were created by earthquakes as the area was believed to be seismically activity. The cracks were filled with sediments which cemented the rocks together solidifying and making the rocks erosion resistant. As years pass by, the pipes still remained strong. There’s a recent theory that suggests that pipes may have originated from pockets that were water-saturated buried under different sedimentary layers. Because of pressure, it resulted to the creation of pathways and eventually compressed them into hard and solid rock. The natural beauty of Kodachrome Basin State Park has mesmerized every single visitor that gets to witness its stunning views. So, where did the park get its name? The name actually came from the National Geographic Society who visited the area in 1938. The visitors were inspired with the contrasting colors and the amazing views of the area. They suggested naming the place after the popular photo film Kodak. 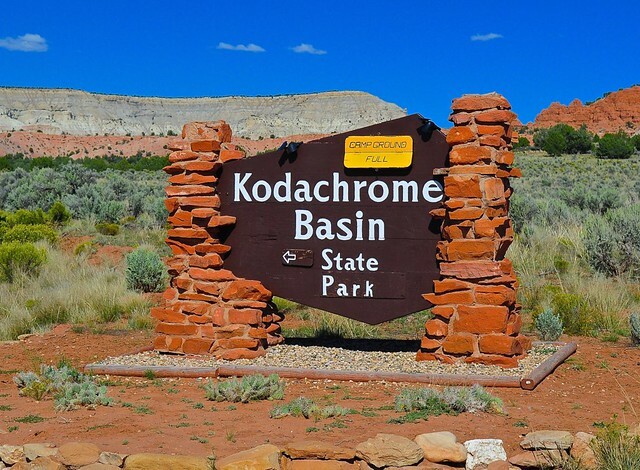 Eventually, the area became known as Kodachrome Basin State Park.